Northerntruthseeker: The San Bernardino California Shooting Is A Fraud: What A Coincidence? 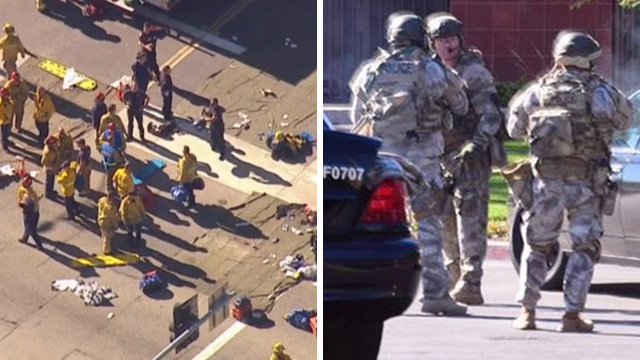 Active Shooting Drills Conducted In San Bernardino Just Before This "Shooting" Takes Place! The San Bernardino California Shooting Is A Fraud: What A Coincidence? Active Shooting Drills Conducted In San Bernardino Just Before This "Shooting" Takes Place! (NaturalNews) Get this: The location where the shooting was carried out today in San Bernardino -- the Inland Regional Center -- has been subjected to monthly active shooter drills, we're now learning. This adds even more evidence to the notion that this may be a staged false flag event to provide Obama justification for outlawing private firearms ownership among law-abiding citizens. At the Inland Regional Center, where she's a nurse, the staff works with clients and parents of clients who are sometimes angry. They have active-shooter drills every month or so. "Drill started," she texted her husband, Mark, around 11 a.m. Yes, this woman actually texted, "Drill started." She recognized the pattern of movement that law enforcement has drilled countless times before. It's the same thing they've been drilling for every single month. What are the mathematical odds that a building where law enforcement has been "active shooter" drilling month after month would be randomly hit by active shooters? Nearly zero, of course. Similarly, of all the buildings in Los Angeles, how many are used by police as training grounds for monthly shooting drills? Virtually zero. "They know it's going to happen..."
Mark Vong said he told his wife to stay calm and not to panic. "They train for this," he said, standing outside a police barricade Wednesday afternoon. "They know it's going to happen." Of course they know it's going to happen! They've been drilling the scenario for months! How blatant do these staged shootings have to get before people wake up and realize it's all a tragic manipulation of public emotions in order to confiscate guns from private citizens and unleash an Obama totalitarian regime that will soon be handed off to Hillary Clinton for the "full tyranny" crackdown? NTS Notes: Honestly, what else would you expect? These criminals are getting absolutely more and more sloppy with each of these phoney shootings, and yet they seem to not care... They know that the vast majority of Americans are now just too stupid and gullible to see the reality that they are being played as suckers and are basically laughing in their faces!